…the revolution in our times has to be urban – or nothing. The greater part of the human species now dwells in cities; more correctly, in urban spaces, which for the most part exist in a continuum with the “country-side”. In some sense, the entire surface of the planet is an essentially urban space. The city thus becomes the central stage upon which political and economic relations are made and unmade, in struggles of power. These struggles in turn shape the kinds of people, subjects, subjectivities, that we are and desire to be. Our commons is an urban commons. The products of multitudinous collective labour, urban spaces are lived along the lines of struggles of appropriation. If cities are the creations of the many, they are also the territories upon which Capital and the State secure their production and reproduction, a reproduction that is carried out, as it has always been, through enclosure, privatisation and commodification. What Henri Lefebvre then termed the right to the city is the right to control the making of the urban space. Who makes the city, in other words, is a central political question and accordingly at the heart of any anti-capitalist politics. 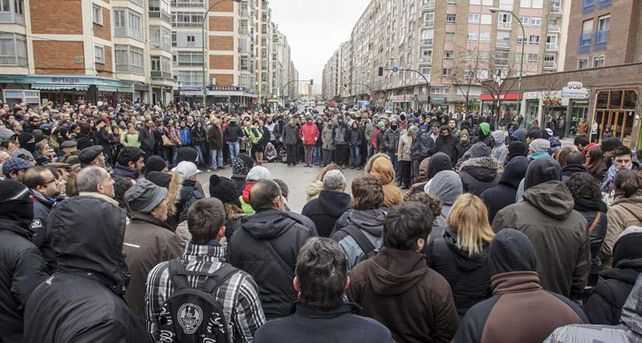 On the 10th of January, in the working class neighbourhood of Gamonal, in Burgos spain, protesters created a human chain in an effort to stop excavators from tearing up one of the areas principal streets, the Calle Vitoria, target of an urban renewal project decided upon by the local city government, held by the Partido Popular. The project involved the transformation of the Calle Vitoria into a boulevard, reducing automobile traffic to a single lane (the traffic in turn to be restricted to collective transportation, ambulances, delivery vehicles and the vehicles of residents), with a parallel lane for bicycles and an underground parking with 246 places, to be sold for 19,800 Euros each (which would give the purchaser the right to use the parking space for 40 years). The existing above ground parking spaces would disappear. The cost of the project, covering 1,200 metres of street, is 13 million Euros. The principle company responsible for the labour belongs to Mendez Pozo, who also owns various real estate companies, as well as television and print media. He also has the honour of having served in prison for corruption, along with a former mayor of Burgos, in an urbanisation swindle. Gamonal is a neighbourhood of some 60 to 70 thousand people. Burgos counts 180,000 inhabitants, with an unemployed population of 18,000, many of them young; and young who are no longer included in this statistic, due to large scale immigration. The city is plagued by debt (160 million Euros), a debt that translates into a politics of austerity in local social services (e.g. the closing of a neighbourhood, municipal day care centre, short 13,000 Euros). The whole farce may be summarised as the injustice of the “greening” of a city. On the 10th of January, the effort to stop work from commencing brought the police against the protestors; and for five days, the battle raged. Riot police brought in from Valladolid and Madrid sought to put down the disobedience through mass arrests and violence. But the resistance only grew with each passing day. The neighbourhood had been protesting the ambitions of the mayor, Francisco Javier Lacalla throughout the autumn of last year. The intervention of the police served to ignite their indignation. The inhabitants of the neighbourhood, and beyond, filled the streets with protest: demonstrations, road blockades, barricades. And those who did not, provided safe houses for protestors fleeing the police, and support from balconies and roof tops. The neighbourhood assembly now became the heart of a movement that not only challenged a city authority’s blatant real estate speculation; it also touched the very heart of authoritarian, neo-liberal rule. 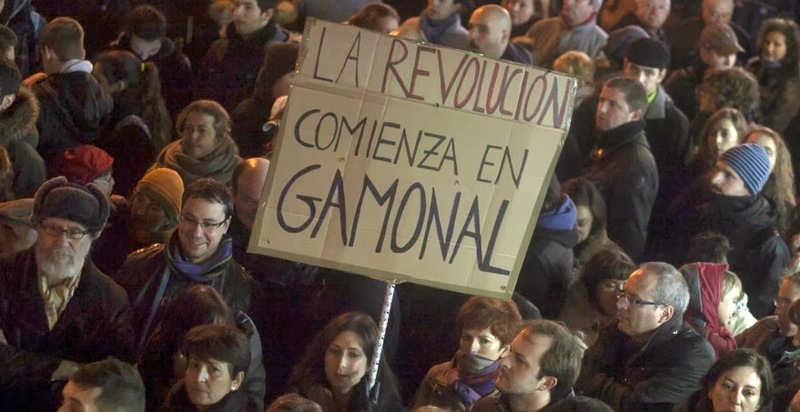 “Gamonal Resiste”: the slogan resonated, became contagious, and soon dozens of protests were organised and were repeated throughout the country … “Todos somos Gamonal”. The story of Gamonal is tragically not new. The rebellion of its people however teaches us that there is nothing inevitable in the rule of Capital. Analysed from the perspective of a broader anti-capitalist struggle, the protest movement in Gamonal may be judged as falling short of what is desired. By contrast, some began to see in it echoes of something akin to Petrograd, 1917; the spark of a revolution. Both views sin by excess, the excess of judging politics on the scale of total power, as a conflict of sovereign wills, with revolution then conceived as a radical and complete rupture with the old regime. 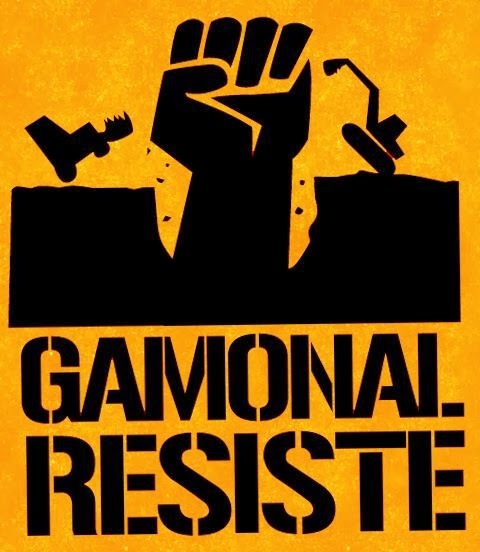 What Gamonal does however demonstrates, and yet again, is the need to see political struggle with a much finer lens; to see it accordingly as a much more uncertain and unpredictable affair where rebellion begins in indignation, but then creates and becomes something other in that creation. The cracks in capitalism, to use John Holloway’s expression, are everywhere. And each crack may fissure along paths which cannot be seen at first, and may which may quickly mutate into something far more rebellious. Gamonal revealed political possibilities for all; and for those who rose up, their city, their lives, will never be the same. This entry was posted in Commentary, News blog and tagged Gamonal, insurrection, occupy the city, rebellion, revolution, spain. Bookmark the permalink.